As it prepares to mark the end of its second decade, the Hideout Block Party is, by the standards of the current summer music festival business, a dismal failure. The event barely breaks even, with most of the money generated going to charity. There are no plans for global expansion, no ubiquitous corporate sponsorships, and no egregious radius clauses tying up the artists to exclusive bookings. Indeed, many booking agents won’t even return its calls, since it’s so much easier to ride the international Lollapalooza, Pitchfork, Riot Fest, etc. gravy trains. The lineup this year is topped by the always-rewarding Death Cab For Cutie (here’s the group live on Sound Opinions) and Chicago ex-pats the Handsome Family, riding the crest of the biggest wave of attention they’ve garnered in their devotedly eccentric career, courtesy of that theme song for True Detective. Here’s the link for tickets. 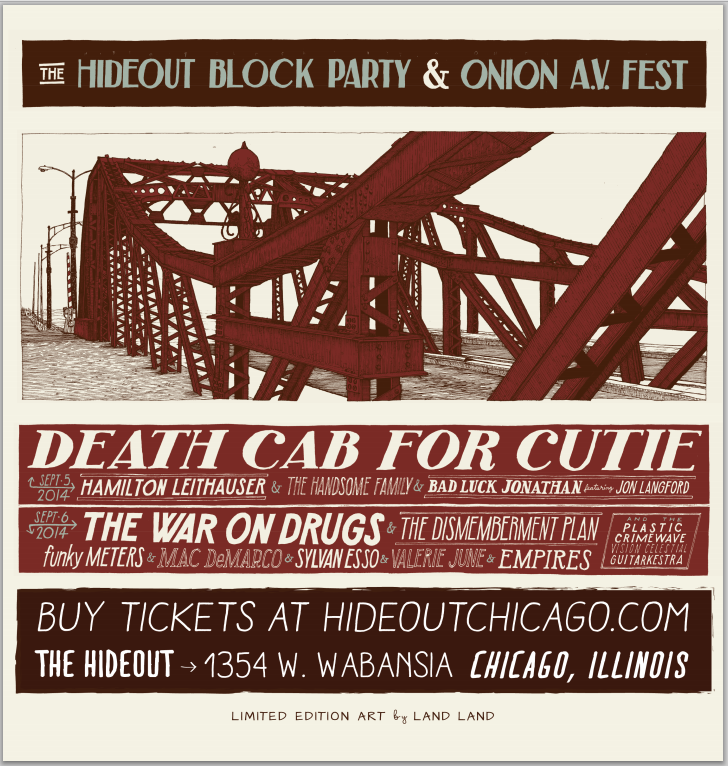 And here is the full schedule for this year’s fun, once again co-sponsored by the Hideout and The Onion A.V. Club. Bad Luck Jonathan featuring Jon Langford, 5:30 p.m. The Handsome Family, 6:20 p.m. Plastic Crimewave Vision Celestial Guitarkestra, 1:30 p.m. The Funky Meters, 6:30 p.m. The Dismemberment Plan, 7:30 p.m. The War on Drugs, 8:45 p.m.